Home >> Family >> Why we are a CSA kinda family. Why we are a CSA kinda family. We missed the signup for the CSA last year and we were pretty bummed. So when the email came in…I was ON IT! Basically I bought all of our vegetables that we’ll be eating this summer in January. Bizarro, right? I had my doubts about a CSA at first. It felt slighty elitist is a strange way. Well, not so strange because it’s not cheap. Also, our CSA is located in a very wealthy town. “Going off to Weston to pick up our expensive organic vegetables that someone picked just for us dahling. Ta ta!” is how it felt, at first. Then the vegetables came in to the house and it was overwhelming. Some I’d never heard of. Others I was sure I didn’t like. I had to wash it all. I had to put it away and organize it so it wouldn’t go to waste. It took some doing. They wanted to go. They wanted to pick. They want to play in the fields. They wanted to talk about the farm and the vegetables and the flowers and the animals. So much of what our kids learn doesn’t come from a lesson at school, but experiences outside the classroom. Shared experiences with siblings about weird vegetables and honey bees. Lessons from mom about how she learned to pick cucumbers from Papa when she was little. My Dad was an organic farmer way before Whole Foods was around. We would eat the beans right off the plant when were kids. That garden was our playground. It wasn’t huge mind you, but the yield was enough for all of us and some of the neighbors. I can’t recreate that in the postage stamp of a yard I have now, but I can take them to a farm every week. Then, more weird things. All those vegetables that at first I was like “Aw, hell no!” Well now they have a place at our table all summer. I figured it out! The farm helps with tastings at pick up. Those tasting helped the kids to like both cabbage and radishes. Here’s the thing about a CSA to all those who would say “you can just by those vegetables at the grocery store you know.” Yes, I know. But I wouldn’t. I really wouldn’t. And neither would you if you’re honest. Would you really walk in to the grocery store and say “Hey – I think I’ll buy some Tatsoi today.” No, no you wouldn’t. Also I did the math, it works out to be about the same as buying it at the market. But you get so. much. more. Because of my experiences with the Four Hour Body and a Whole Food Detox, we have been trying to eat a more whole food diet in our house. And then there’s pesticides, and Monsanto, and being able to eat LOCAL. 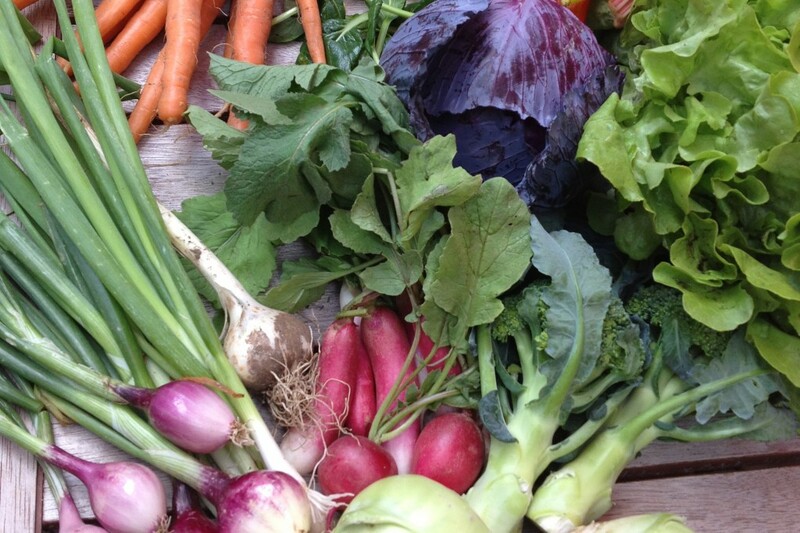 A CSA just makes sense, for us. Now we have not one, but two, spaces planted in our tiny yard. One for vegetables and one for flowers. We may not get anything to put on the table out of them, but the kids couldn’t be happier tending to them. My son won’t eat chicken nuggets, but he will eat cole slaw. So there’s that too. My youngest finally gets to go the the faaaaaaaaaarm this year. I can’t wait to see what his siblings show him and what he discovers there! I adore CSAs for all the reasons you mention. Right now I’m not signed up because of our erratic schedule, but you’ve inspired me to start again. There’s nothing like having your kids involved and allowing them to actually make that connection between food and earth. It’s so true. Food and earth. Not always just food and store. 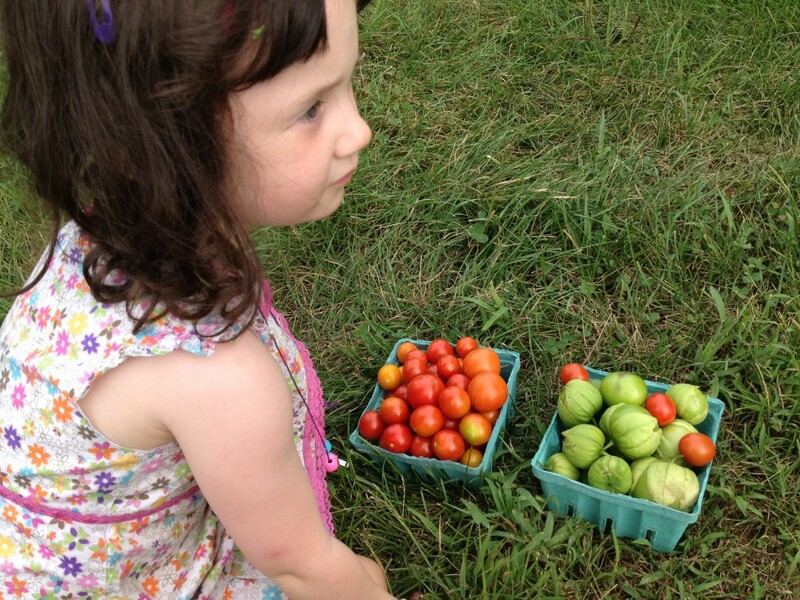 Our CSA gives us three pickup times to choose from, one even on a weekend. They ask that we choose one for the summer, being able to alter it two times for schedule changes. They finally listened to people like you! !